Gary Illyes from Google was speaking at the Friends of Search conference today and he made some comments about algo changes, including Penguin and possibly Panda. We have seen plenty of algo changes recently, among the many changes Google makes on a daily and weekly basis. 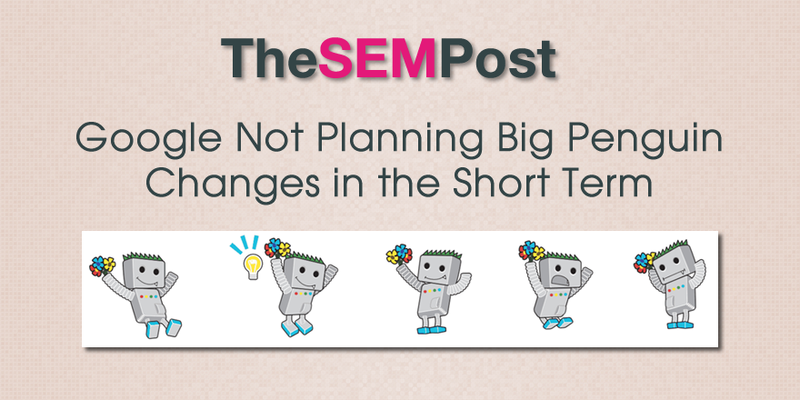 But he said today that they are not planning any “big changes” in the Penguin algo in the short term. While the tweet doesn’t specifically mention Panda, it is likely that it is included in the “etc” since Google hasn’t announced any major news about Google Panda since their quotes to The SEM Post last year in the Google Panda Algo Guide. It is important to note that it does refer to big changes, and it is likely that there have been tweaks since the last major known update to Penguin and Panda. Illyes also recently said that they plan to be transparent about any “big substantial changes” they make to the Google Penguin algorithm. Of course, this doesn’t exclude smaller changes being made, which is likely.